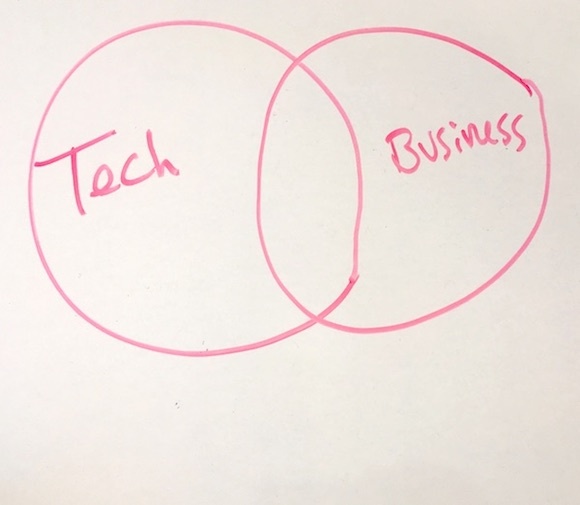 Instead, the single most common problem I see on teams is best expressed with some Venn diagrams on a decidedly low-tech whiteboard. First, consider that every product team has three main concerns: tech, business, and customers. • Tech: What features can we build, and what constraints determine what we can't build? • Business: What are our plans for revenue, our growth metrics, our strategy guiding future decisions? • Customers: What are the key unmet needs we're solving? How are we improving customers' lives? And what are customers' resources - time, money, and tech expertise - that they'd want to devote to our product? 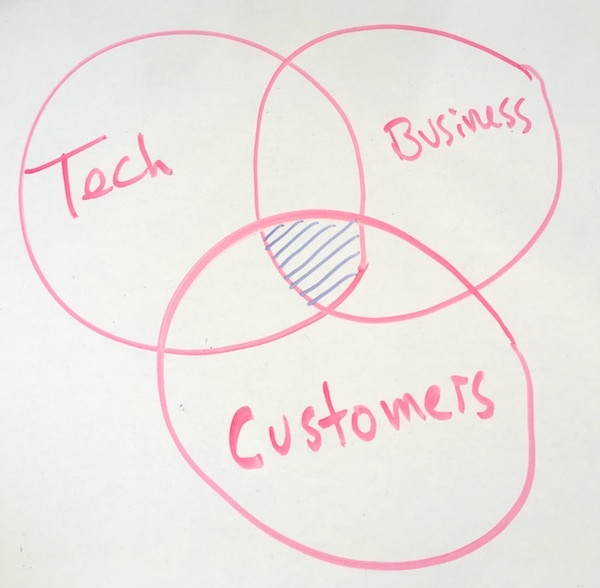 The best product teams align all three of those circles. Very few manage to do so. 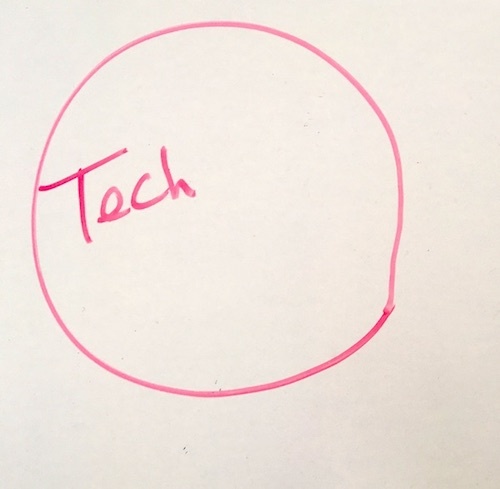 On the low end, some teams - usually short-lived - focus on one circle: what cool thing can we build? Cool features, bro. The team can build this but probably shouldn't, until and unless it figures out a viable business. Above, the intersection contains tech that can be built and fit the business goals. And this is where most teams make a fatal mistake: once they achieve alignment on tech and business goals, they sprint toward launch. But customers are not included. • ...while making a series of blind guesses about customers. The team is thus building a product with the best engineering, guided by a carefully thought-out strategy, combined with a bunch of random throws at a dartboard about whether they're meeting a customer need. And yes, these teams conduct user research. It's what I call validation research. The team brings a user into the conference room, shows them the product, and says: "Here's our best guess for what you want - please take a quick look and let us know what you think." The user thinks the team is asking for feedback on their UI layer (how nicely the colors, text, and UI elements blend into a pleasant presentation). "Very nice," the user says, "just make the buttons a little bigger on this screen." Teams today often are doing outstanding work in their engineering, marketing, and strategy functions. But they're still flying blind when it comes to understanding their customers. Once again, this can be a fatal error. Conversely, avoiding this error can be one of the most important decisions the team makes. Above, the shaded-blue section shows that the team isn't just building "tech that satisfies business goals" - instead, it's focused on a product that operates within tech constraints, fits business goals, **and** meets a customer need. I know this concept may seem obvious from such a simple Venn diagram, but I have to point it out: ignoring this is the single most common failure I see on product teams today. • Spend time with customers in their environment, instead of bringing them into your conference room. Customers act more naturally, and give more authentic insights, while in their usual environment. • Don't ask customers what they need, or whether they "need" your product. Instead, have a contextual conversation, let the customer help lead the discussion, and find out what their needs are. • Ask customers to show you what they use, currently, to solve their problem. Only after they have demo'd their solution should you show your own prototype. If your team wants better customer insight, drop me a line or just read my book Customers Included. Whatever you do, make sure you include customers.